Brahma, Vishnu and Mahesha are considered the highest gods of Hinduism, next only to Brahman in importance and hierarch. Functionally they represent the triple functions of Manifested Brahman. Hence they are also called the Trimurthis or the Trinity of Hinduism. Brahma is the creator, Vishnu is the preserver and Shiva is the destroyer. They are assisted in their duties, by their consorts, or associated goddesses namely, Saraswathi, Lakshmi and Parvathi respectively. Saraswathi is the goddess of speech and Lakshmi, of wealth while Parvathi is usually worshipped as Mother Goddess. These three gods are rulers of three different worlds. Brahma is the ruler of Brahmalok, Vishnu of Vaikunth and Shiva of Kailash. In the Vedas we do not find any reference to the concept of Trinity. 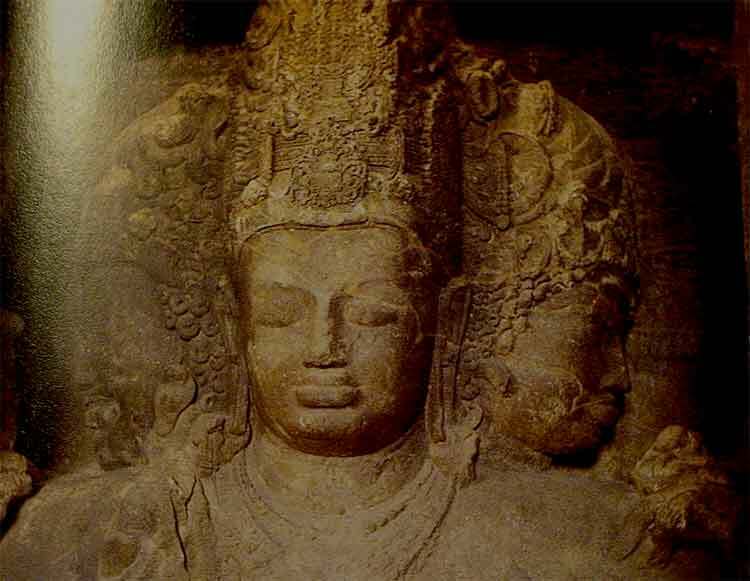 During the Rigvedic period, Vishnu was a minor solar deity, while Shiva was almost unknown. The Rigvedic hymns speak of Rudra, a fierce god of the skies and thunder, father of Maruts, who was invoked mostly as the healer with wondrous medicines. But we are not sure whether he was in any way connected with the Shiva of later times. It is quite possible that the concept of Trinity was not a Vedic concept but another from another native religious tradition of the subcontinent, and probably with some minor modifications and name transference, especially in case of Brahma and Vishnu, it was assimilated into the Indian religious tradition. It is now well established beyond doubt that the subcontinent had a number of religious traditions spanning over at least two to three millenniums before the time the Vedic Civilization was firmly established in the North. Contrary to the popular opinion, it was probably not the Vedic culture which prevailed during the progress of Indian civilization, but other traditions which absorbed it and assimilated it into their practices acknowledging, either fully or conditionally, the validity of the Vedas, which gradually gave birth to a complex and diverse tradition that we today identify as Hinduism. Brahma, Vishnu and Shiva, the triple gods of Hinduism, are different in a limited sense only. They are considered manifestations of the same Supreme Isvara, who is also known as the Saguna Brahman or the awakened or dynamic Brahman. Isvara Himself is considered by the monists as a reflection of Supreme Brahman in (the triple gunas of) Nature. Since ordinary human minds cannot comprehend the oneness of the universe, it becomes difficult for us to understand this concept clearly. To summarize the idea briefly let us take the analogy of a person performing different tasks. Just as a person becomes different persons while performing different roles or duties in the mental plane though not in the physical plane, God who exists in innumerable planes simultaneously appears as the Trinity in three different roles. The difference if any is in appearances which is part of the grand illusion that He weaves all around us. The triple deities (Trimurthis) do exist in space and time, although it is difficult to explain the nature of their existence, as well as their true potentialities since they belong to the very highest realms of creation. In the human beings they exist beyond the mind as potentialities of the divinities of the super-mind or the divine mind, who are envisioned only by a handful of adept yogis in deep meditation. Seemingly there is nothing physical about them although in their ignorance people tend to consider them human beings with flesh and blood. From the experiences of adept yogis and self-realized souls, we understand that although the triple deities remain in their ethereal aspect as pure energies and consciousness with dimensions beyond our imagination and comprehension, they can assume physical form when they deem fit, appear anywhere in the universe at will, and manifest themselves in whatever way they choose. They are God's most pleasing and benevolent aspects in the manifested creation, personifying His dynamic functions. They represent His will in cognizable forms with which the human mind can interact and relate well. Are these gods different from each other? To the question whether these gods are different, the answer is both yes and no. They are different because, from human point of view they perform different tasks, have qualities and energies that differ widely from one another and also control different worlds that seem to set widely apart. But as we have mentioned earlier, at the highest level they are the three aspects of the one and the same supreme Reality. Together they are like a mighty flow of energy branching out into three different streams at the point of contact with human awareness. It is difficult for us to understand them, because we can understand reality in terms of comparisons, with reference to one another, not by the thing itself and because we can concentrate our attention upon only one thing at any given point of time, while our minds cannot hold two thoughts at a time. Imagine an intelligence that can understand infinity without the need for any comparisons and hold an infinite number of things simultaneously in its unlimited field of consciousness without any reference to each other, without the need to know, without any effort to know, and knowing them all at a time! This is the consciousness of these divine planes. Which God should we worship? Brahma is the creator who is seemingly preoccupied with his task of creation. People therefore do not prefer to worship Brahma, although it is true that he helps people with wonderful creative ideas whenever they approach Him for help. Many however worship Saraswathi because she is the goddess of knowledge and refinement and believed to help those who want to refine their character through education and spirituality. Worship of Brahma and Saraswathi is ideal for those who pursue knowledge, creativity and academic excellence in their lives. Students, artists and craftsmen, and those who are endowed with special talents and skills, should worship these two for success and spiritual progress in their lives. The worship of Brahma is also ideal for those who want to pursue Jnana marg or the path of knowledge. Prajapati Brahma is indeed referred as the spiritual teacher in many Upanishads and Puranas. Vishnu is the preserver and maintainer of the worlds. His primary task is to protect dharma and maintain the universal order. He does it by encouraging people to be on the side of dharma and pursue their religious duties as householders with a spiritual bent of mind. His consort, goddess Lakshmi provides all the material resources necessary for the management of the worlds. Vishnu and Lakshmi are therefore an ideal choice for people who want to live ordinary lives and pursue materialism with an eye towards religion and spirituality. The worship of Vishnu is ideal for those who want to follow the path of devotion. Shiva is a god of anger and destruction. He destroys all that is evil, that is bad and that is wasteful or excessive. Shiva is not a negatively destructive power. His destruction is an essential aspect of creation because without destruction you cannot really create anything. It may sound strange, but it is true that in reality destruction is the other face of creation. Both compliment each other, depend upon each other and initiate each other. For example you cannot experience the next moment unless your experience of the present moment is replaced or rather destroyed by the experience of the next. In reality your existence is but a series of destructions of each and every passing moment. The apparent continuity of our existence is an illusion, because in truth we are born and we die every single moment. The plant cannot come into existence unless the seed is destroyed and its energies are transformed. In the same manner you cannot achieve success in any field unless you transform things, either within yourself or within your environment. You cannot achieve spiritual progress unless you eliminate many undesirable habits, thoughts and tendencies that are otherwise self destructive and come in your way of creating a better future for yourself. Destruction is therefore an integral part of progress and change. Creation leads to destruction and destruction to creation. And at the end of it all a more lasting death is required for the soul to review its plans and options for its next birth. Shiva is therefore not a destroyer in the negative sense, but a god of immense energies who ensures our material and spiritual progress through inner transformation. Who should worship Lord Shiva? It is ideal for those who are willing to undergo inner transformation for their material and spiritual success. In other words follow Lord Shiva if you want to achieve self realization through a path of constructive destruction and radical transformation of your personality. The worship of Shiva is ideal for those who are willing to follow the path of renunciation or lead radical lives through courageous decisions. 1. Students, learners, scholars in the pursuit of knowledge, artists and craftsmen should worship Brahma and Saraswathi for inspiration and creativity. 2. Householders who want to continue their household duties and remain amidst the humdrum of life, should worship Vishnu. 3. People who are spiritually inclined, willing to explore their inner worlds through meditation and tantra, turned away from the lures of the worldly life, drawn to secluded places and loneliness, willing to undergo hardships, uncertainty and social disapproval through self discipline and austerities should follow the path of Lord Shiva. A note of caution: If you are not following these guidelines please do not bother because God in his infinite wisdom provides innumerable paths to his devotees and gives them immense freedom to exercise their free will in accordance with their inner nature. In such matters it is always wiser to follow ones own inclinations and inner promptings of the soul rather than the advice of others.